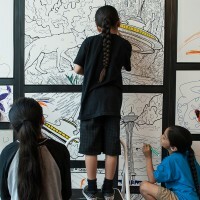 A hands-on art activity in Tacoma Art Museum studio during the 6th Annual Northwest Native Celebration. 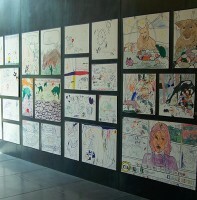 The project is an invitation to think about the trickster, Coyote, as an active player in contemporary events. 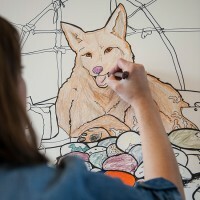 The artwork explores Coyote’s role in the creation of the space needle, epic sinkholes, even the root cause of global warming, and sets the stage for the audience to create a few of their own as part of this large collaborative drawing & coloring installation. Coyote was once a very busy guy. He roamed the continent playing both the trickster and hero. 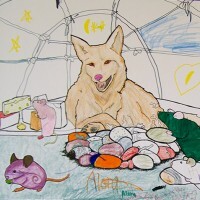 His countless escapades form the stories that demystified the world and connected the two-legged people to the animal-people. Most Coyote adventures officially end with his death and conversely begin with his resurrection. His cousin, the Fox, can revive Coyote if even a whisker or a bone remains intact. 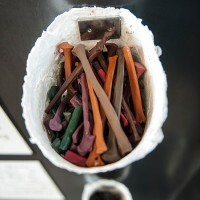 These cast crayon bones, symbolically offer the opportunity to bring Coyote back to life. 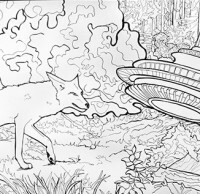 This artwork asks the question, what has Coyote been up to lately? 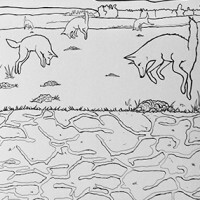 How would coyote explain global warming? Did he, in fact, invent the internet? What part did he play in the 1919 fix of the world series? 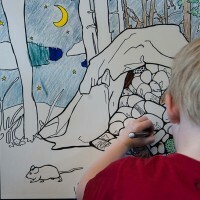 Living in a google culture, where most wonderings can be succinctly resolved, I’d like to invite the audience to re-engage with imaginative storytelling through their current life experiences. 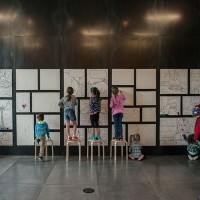 Commissioned by the Tacoma Art Museum for the Northwest Native Celebration, Tacoma Art Museum, Tacoma, WA.